Hubble discovers the first blue planet outside the Solar System. 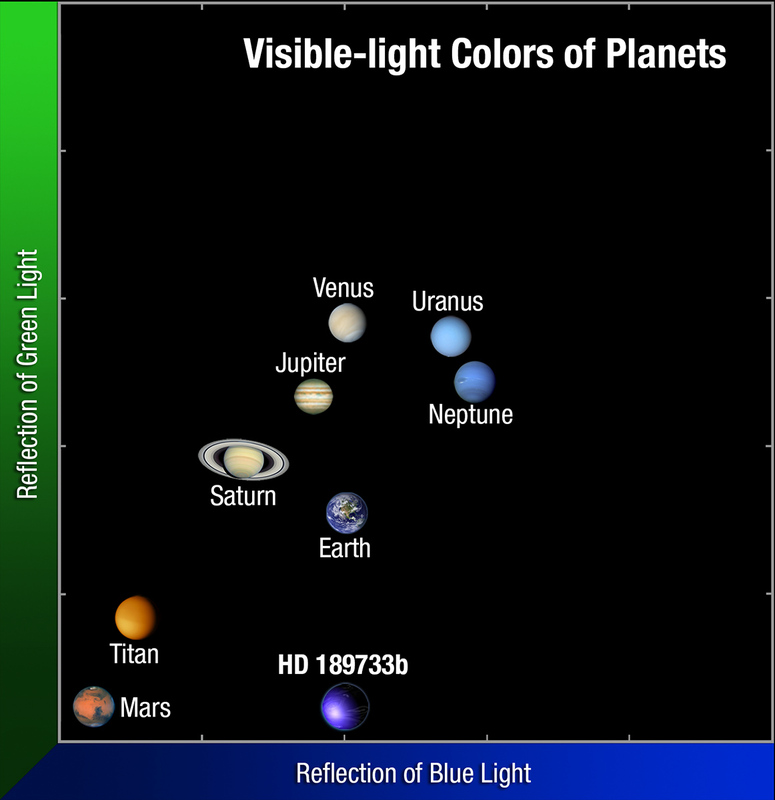 Thanks to NASA’s Hubble telescope, planet HD 189733 b has become the first planet outside the Solar System to have its color directly measured - and, like Earth, it’s blue! 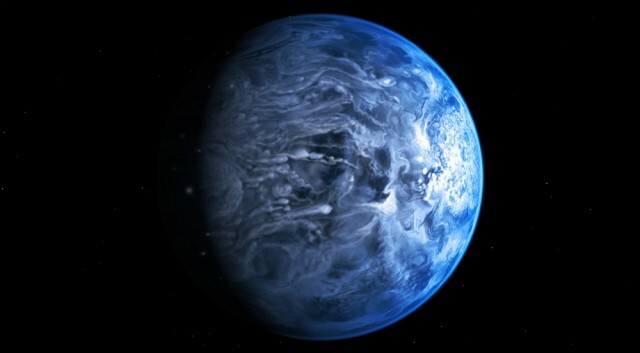 Unlike our home planet, though, HD 189733 b isn’t blue because of liquid water - the blue color likely comes from clouds in the atmosphere made of molten glass. Planet HD 189733 b, which orbits the star HD 189733 A, is 63 light years away in the faint constellation Vulpecula (the fox). Initially discovered in 2005 by some French astronomers who observed it passing in front of its star, HD 189733 b is one of the best-studied exoplanets. Prior to this new finding, we already knew that the planet was a hot Jupiter - a massive gas giant that orbits very close to its parent star - and that, using polarimetry, it was most likely blue. Today, the blue color has been confirmed by a spectrograph aboard Hubble. During an eclipse of the planet - where it passed behind the star and out of our vision - Hubble recorded less blue light coming from the star, while the other colors remained the same. This strongly indicates that the light reflected by HD 189733 b’s atmosphere is blue - and thus, if we were close enough to directly observe the planet, it would appear blue. ”This is the first time this has been done for optical wavelengths,” says Alan Boss, an astrophysicist at the Carnegie Institution for Science in Washington DC. It wouldn’t normally be possible to observe such a fluctuation from 63 light years away, but the size of the planet, plus the amount of light reflecting off it from its very-close-by star, mean that Hubble can do its thing. As for what causes the planet’s blueness, the current theory is that its atmosphere is full of clouds that contain tiny silicate particles, which absorb some light frequencies but reflect and scatter blue light. In the words of NASA, because the surface of the planet is around 1,500 Fahrenheit (815 Celsius), it’s possible that it actually rains molten glass on the surface of HD 189733 b, sideways, in 4,500-mph winds. Beyond its blueness and surface temperature, we know that its orbital period (i.e. the length of a year) is just 2.2 days, and due to its proximity to its star, it’s tidally locked - one side of the planet always faces the star, while the other is always in shadow.